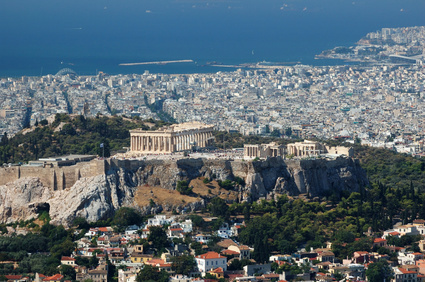 Monarch Air Group provides private air charter in Athens, Greece. Our clients benefit from top-notch service, unrelenting dedication to safety, wide selection of aircraft, and years of experience in chartering private jets. To obtain a free quote, please use our online quoting tool provided below, or call toll free 1-877-281-3051. Monarch Air Group provides private jet charter flights in and out of Athens, Greece. Situated on the Attica peninsula reaching up to Central Greece, Athens is the capital of Greece with a history tracing back more over 3000 years.It was a city worshiped by gods and people and nowadays it has some of the most remarkable history in the whole world. Renowned as the social, political, cultural,commercial and financial center of Greece, Athens welcomes visitors worldwide. There are numerous archaeological monuments including Odeion of Herodes, Acropolis, Atticus, Roman Market, Olymbion, Panathinaiko Stadium, Temple of Poseidon, and Kallimarmaro. Athens boasts many museums, different neoclassic buildings, luxurious department stores, great restaurants, small intimate shops,traditional bars, and numerous theaters. 1. ATH, Eleftherios Venizelos, Athens, Greece. 2. HEW, Hellinikon (Closed), Athens, Greece. 3. JSS, Spetsai Island, Spetsai Island, Greece. 4. PKH, Alexion, Porto Kheli, Greece. 1. Plaka, 7 KAPNIKAREAS, Athens. 2. AVA Hotel & Suites Athens, Λυσικράτους 9, Athens. 3. ELECTRA HOTEL ATHENS, Ερμού 5, ΑΘΗΝΑ ΣΥΝΤΑΓΜΑ. 4. FRESH HOTEL S.A., Κλεισθένους 2, Athens. 5. Attalos, Αθηνάς 27, Athens. 6. ACROPOLIS MUSEUM BOUTIQUE HOTEL, Λεωφόρος Συγγρού 48, Athens. 7. Hotel Grande Bretagne, Αριστογείτονος 15, Athens. 8. Olympic Hotels S.A., Athanasiou Diakou Street 28-34, Athens, Greece. 9. Athens Park Hotel, Λεωφόρος Αλεξάνδρας 10, Athens. 10. Plaka, 7 KAPNIKAREAS, Athens.